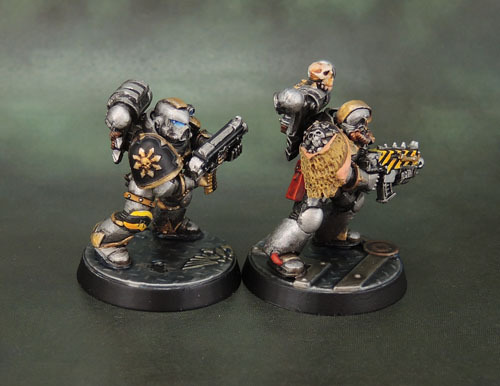 Iron Warriors Army Building – Restarting. | Azazel's Bitz Box. 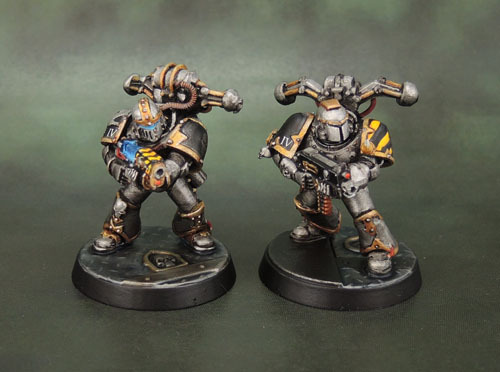 Iron Warriors Army Building – Restarting. I’ve slowly been buying Forge World bits and accumulating them for years now. 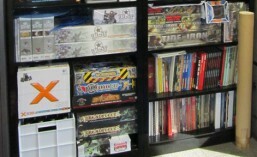 Lots of those bits and kits and models are Space Marine ones. I’ve also bought my fair share of parts from Anvil Industry, Kromlech, Maxmini, etc and more as well. (All awesome guys to deal with, by the way!) I originally started purchasing these many models and components for my nascent Iron Warriors Chaos Space Marines and Crimson Fists Space Marines armies. This started long before Forge World began riding the Horus Heresy money train, and the concept of “30k gaming” wasn’t yet a thing. I wanted MKIII Iron Armour in particular for kitbashing into my IW, and obviously Mark VI “Beakie” armour works for a RT-inspired marine force, some Mk IV and V to mix parts in seemed appropriate as well. Now it’s 10 or more years later, and “30k” is now a thing – with a growing in-depth and generally well-written background. 40k is now a borderline-unplayable clusterfucked ruleset but still a first love, at least in terms of background, and I’m finally restarting on these old Iron Warriors – beginning by rebasing and completing the models I started in the mid-2000’s, paused and then came to a stop on again around 2009. The question for me to ponder right now – much more for the Iron Warriors – is how do I build them? 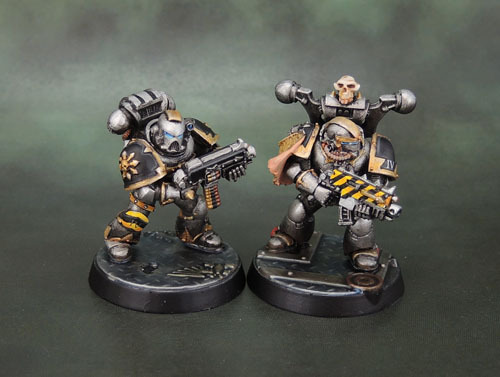 Do I build them as a 40k Chaos force, replete with a mix of chaos armour, scavenged modern and also heresy armour – or do I try to build them as two separate forces – 30k and 40k Iron Warriors. Though to be quite honest I don’t know if I’ll have the painting stamina and interest to build and paint a full army of the massive size that 30k seems to demand. Unlike the three push-fit “starter kit” style Chaos Marines from Execution Force that made up my “proof of concept” models as far as rebasing my IW on the new Citadel bases, every other model of my Iron Warriors is.. well, they’re far from all something one could consider conversions, but they’re at least kitbashes from the CSM kits, Iron Warriors and Iron Hands metal upgrade parts, and of course loyalist marine parts. In this way, pretty much every model will be in some way unique. The Close Combat-oriented squad, which I’ll get to work on after I finish this “Tactical” style squad also features bionic CC parts poached from a variety of sources. I’ll continue to kitbash my CSM Iron Warrior models from all of the previous sources of course, plus parts from the “Horus Heresy” models. The question is on how many do I leave in the “30k pristine” state – looking somewhat like these guys. Because let’s face it, those models linked look bloody awesome as well, without a hint of Chaos in their paint or mixed armour in their modelling. While I’m not averse to using sculpted parts with chaos stars on these guys, I’ll be avoiding the gribbly side of Chaos as much as possible for the Iron Warriors, so No Rogue Trader models, nor any Dark Vengeance-styled ones either. What I (eventually) do with the Imperial Fists models and bits will be a much easier choice. I don’t want no yellow marines in my collection. 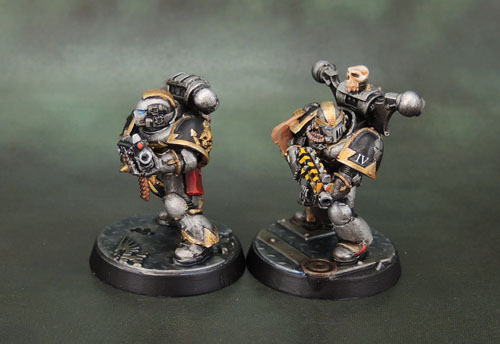 People like Nerdfest have done some great models in the Imperial Fists livery, and I think they’re great, but still, no yellow Marine armies for me. (ok, maybe one squad integrated into the Crimson Fists, down the line.) The mantle of the hated foe of my Iron Warriors will be taken by both the Crimson Fists and the Black Templars, so pretty much all of the “Imperial Fists” upgrade parts I’ve gotten will be shared between those two venerable loyalist chapters. I guess the other question is whether I drop all three of the Execution Force Iron Warriors into this squad, or whether I try to space them out over multiple (three?) “Tactical” CSM squads to avoid repetition of pose within each unit. Another question to ponder. 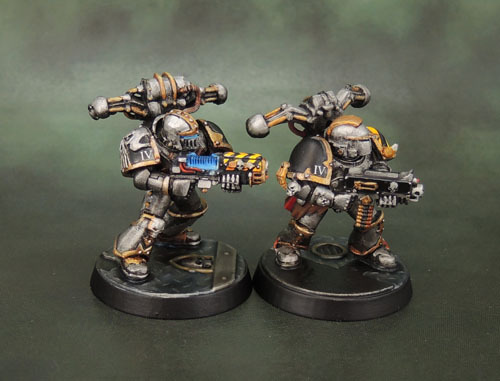 Then again, I don’t even have a current army list (or anything like it) drawn up, since the last time I used these guys in their semi-painted state was in 3rd or 4th edition using a slightly-modified set of the Combat Patrol rules and based off the Index Astartes Iron Warriors list. What are the current CSM rules? 6th Edition Codex plus the PDF errata? Gah. I don’t look forward to writing up an army list for these guys. This entry was posted in 40k, Chaos, Iron Warriors, Realm of Chaos and tagged 40k, Chaos Space Marines, Iron Warriors, Warhammer 40000. Bookmark the permalink. I’m going to be no help at all making suggestions on army lists, but I’ll note that if you want an army that works well visually in both 30k and 40k then Iron Warriors have to be the pick of the bunch. The tendency to chop off mutant bits and replace them with bionics, plus a contempt for chaos and an aversion to its worship means you could use the same rank and file, tanks etc across both settings. Then just mix in any additional units that you fancy to switch between the Heresy and 40k. 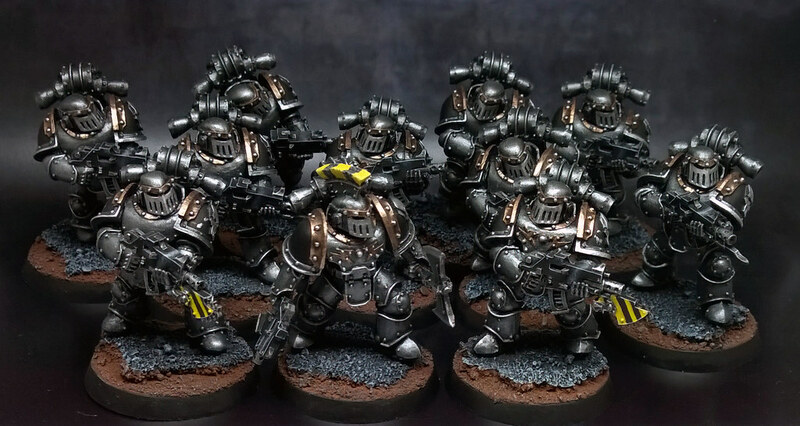 I do like an Iron Warriors army and those guys are looking excellent – keep ‘em coming! Thank you. 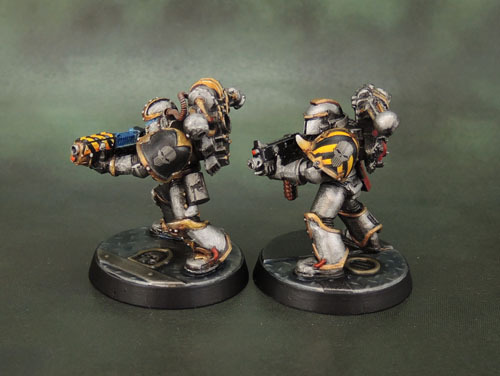 I think I’ll just keep some in relatively pristine 30k-style armour and consider them to be a sub-sect of my IW that are concerned with hardline martial honour and keeping the purity of their armour unsullied by change. Maybe in 40k I could use them with Plague Marine profiles using the same kind of “counts-as” logic as I readily use in KoW? (+1 toughness for Crusade-Era armour, Grenade Drill and Ancient Blades?) – either way, I’ll worry about all of that sort of thing once I’ve got enough painted and built. Thanks Alex. I’m still very pleased with these guys, even though they were built a long time ago. I notice that I forgot to touch up the MK VII Helmet’s sensor lens with one of the new paints (playing around with them). Hopefully the forthcoming ones are just as interesting! That’s a nice looking bunch of models. I would try and mix those snap fit models in as squads you can. And as for the what look, I would continue to build on what you got going. That’s the current rules set. There’s a new FAQ on the way. What helmets did you use, and where did you purchase them from? From left-right: Standard Plastic SM head, GW Iron Warrior metal head with horns cut off, Plastic Khorne Berserker head with “bunny ears” cut off, GW Iron Warrior metal head.